Welcome to our school family! This is where the learning journey at St. Andrew’s begins and we are thrilled by the prospect of accompanying your child through it. At Little Learners House your children will gain confidence and discover what they are capable of and can do for themselves, while promoting their asking wonderful questions about the world around them. The complete rework of our website, which makes it possible to view it from mobile devices, will help you keep in close contact with everything that takes place at “Little Learners”, the News Section will keep you posted on the events to come, outings, talks to parents, the different educational activities, etc. We hope it constitutes yet one more communication channel that complements the distinctive personal style that characterises St. Andrew’s School. “Little Learners House” encompasses all of St. Andrew’s Preschool education where children take their first steps in learning outside their family environment. 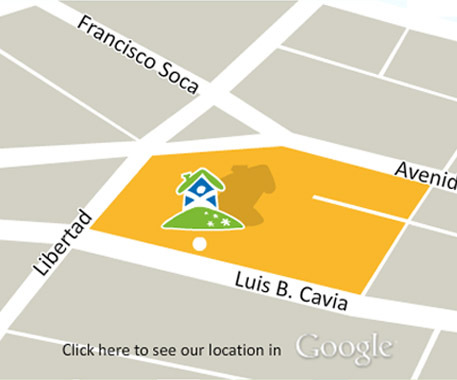 It is situated in one of our traditional houses, which has been carefully revamped and converted for use as a Preschool. Classrooms are attractively furnished and have an array of materials to suit young children’s learning needs. “Little Learners House” aims to offer parents the opportunity to give their children quality education from the very start. The Preschool, although within the main school’s premises, works independently with a secure playground just for it and at the same time the children profit from the expertise and cognizance that belonging to St. Andrew’s School entails. To lay the foundation of an excellent bilingual education. To learn through play, experimentation and observation. Numeracy and literacy skills development. Personal, social and emotional growth. To foster curiosity about learning. To care for individual needs. To provide a safe and rewarding environment. Read more about our History by clicking here! St. Andrew’s School is a recognised elementary, private school which has offered first-class, child-focused education, from nursery to the age of twelve, since it’s foundation by Agnes Nery, its first headmistress, Fay Crocker, Margaret and Sylvia Towers. Led by the unerring hands of Ms. Nery, their aspirations were to deliver the highest, possible standards of teaching, which placed St. Andrew’s as the leading organization it undeniably is today. The school once envisioned is over 50 years old and its philosophy still is to look into the future with renewed and unflagging energy without losing sight of the solid roots on which it was laid. It was with the Nursery that the fledgling school initiated and how its growth was sparked off, so this is why today we keep focusing on it and aim at constantly enhance it, invigorate it and move ahead of times. The result of this process is “Little Learners House”. The core of the stage is to explore, stimulate, investigate and play. The beginners learn social skills such as sharing, showing respect and good manners while gaining personal independence. 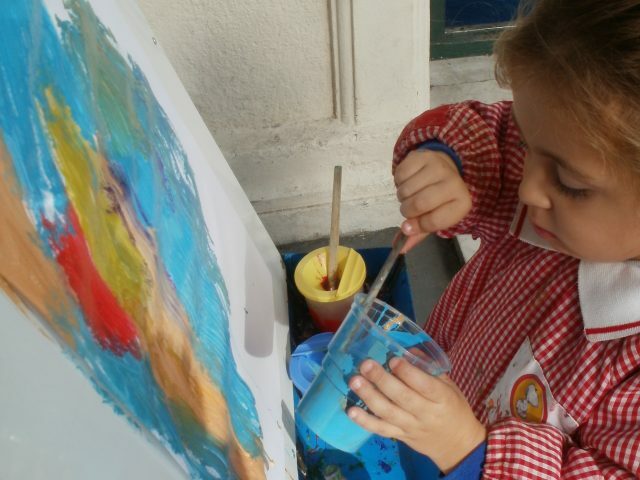 Painting, gluing, dough and sand related activities, as well as outdoor ones are crucial to support the development of children at this stage. The psychomotricity room also plays an important role in their education together with music and physical education. *children should be 2 by 31st December of the previous year. Timetable: 9:00 to 12:00, Monday to Friday. The focus here is to encourage the children to play and work more independently, learn to co-operate as part of a group and start their journey on more structured, educational activities. Their fine and gross motor skills are incentivated. The psychomotricity room is an integral part of the proposal at this stage, together with music, art, crafts and physical education. *children should be 3 by 31st December of the previous year. Our children take pleasure in participating in weekly music workshops where they enjoy different types of music and explore time, rhythm and beat. They listen to the guitar and try percussion instruments. 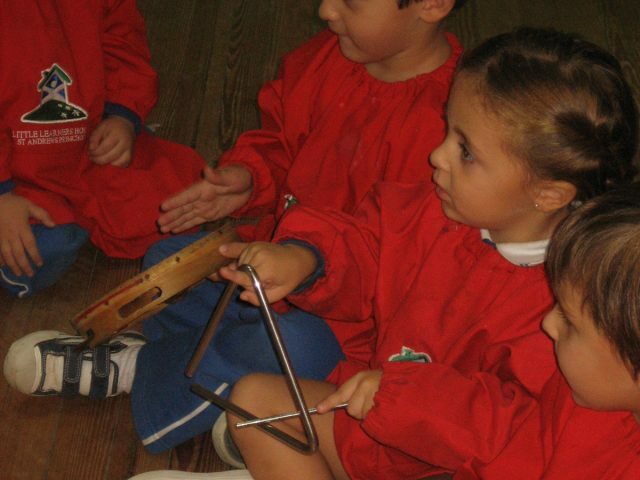 They also focus on how sounds can be made and changed and match movements to music while learning songs from memory. Instructors from "Música Viva" lead these workshops bringing their expertise to our classes. Play is in the young children's nature and is their main tool for learning. Therefore, as a way of enhancing all areas of their development we include drama, role-play and free expression where they use movement, play-acting and storytelling as a means of communication. It is a captivating way in which our little learners interact in a group, build their imagination, and learn about individual roles and about the importance of forming good relationships with others. One of our main concerns is a balanced development of each child and in this sense we give our young people's opportunities to be active and improve their body awareness and skills of coordination, control, movement and manipulation. Our children enjoy using climbing frames, tunnels and other equipment while their gross motor skills, balance and suppleness are stimulated. Above all, we help our children develop a positive sense of well-being. Among other activities our children find pleasure in baking, cooking, and preparing "little delicacies" to share. They combine and mix ingredients watching how the mixture transforms itself into their final creation. 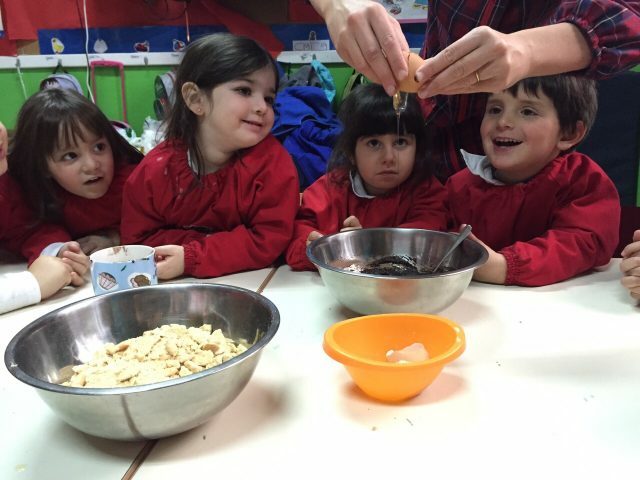 It is one of those activities which preschoolers thoroughly enjoy and which offers the balance of learning about healthy choices in relation to food. Cooking as well as tending our vegetable garden, form a unit that is great aid in promoting positive nutrition habits from this early age. 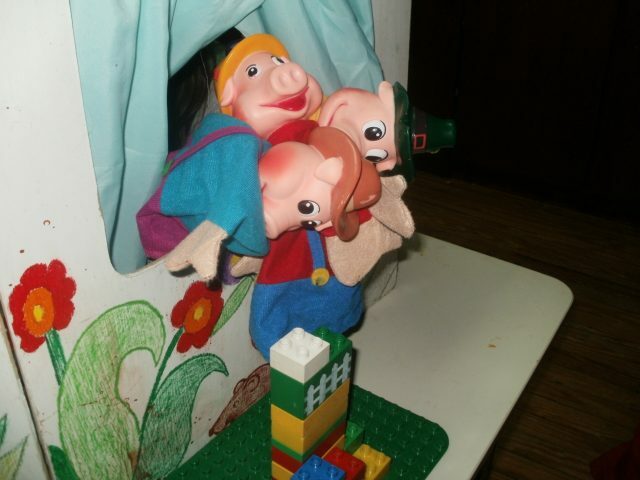 At Little Learners we support children's natural creativity and stimulate them to enjoy the arts. They use a lot of different materials such as finger and water paint, crayons, markers, pastels, acrylic, all sorts of paper, foam and mud to express themselves and represent what they see and feel. Experienced teachers freely and skilfully guide them into the world of art and also help them to see the value of their own productions as well as that of their peers and well-known artists. We aim at a smooth transition from preschool to primary equipping children with all the necessary skills to succeed in their next stage of development. Kindergarten builds on the knowledge gained and the emphasis is placed on developing confidence and capacity to learn. The mornings are devoted to more structured instruction when literacy and mathematical notions are enhanced. The afternoons are play-based. Music, art, crafts, movement are highlighted and gross and fine motor skills are refined as they continue to work in the psychomotricity room. We try to instil a feeling of belonging inviting children to contribute to school life and fostering a sense of healthy community pride which in time contributes to becoming caring and responsible human beings. *children should be 4 by 31st December of the previous year. Preparatory builds on the work from Kindergarten securing the foundations for pleasant and effective learning in the rest of primary school. The children’s literacy, numeracy and reasoning fluency is promoted as essential skills for their studies in the following years. They are also learn about broader topics which introduce them to geography, and nature. They are also involved in art, music and drama activities. Noble sense of self- worth and confidence are instilled to help children become constructive life- long learners. *children should be 5 by 31st December of the previous year.